Global Success Club Reviews - Legit or Scam? 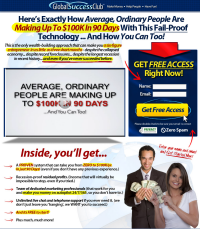 Global Success Club Reviews – Legit or Scam? While GlobalSuccessClub.com never actually says what kind of a business opportunity this is, based on the information given throughout the sales page, it seems likely that this is just another training course for affiliate marketing. Since Global Success Club says you need no technical knowledge whatsoever, and that they provide you with a “turnkey system,” it’s likely that their affiliates are given pre-set web pages from which to promote their club. This is why, if you search for information on the Global Success Club, the only websites that easily come up are from people who are affiliates for the program. So What Is Global Success Club? The Global Success Club is kind of a hybrid between a business opportunity – as mentioned before, likely a basic training course in affiliate marketing – and a self help seminar. In addition to a business system, members of the Global Success Club have access to regular videos and materials prepared by self help gurus like the infamous Tony Robbins. The concept behind this Global Success Club method is that you will not be able to achieve in the world of business unless you have the correct positive attitude. Getting this continuous access to the motivational methods of people like Tony Robbins will keep your head in the proper place necessary for success. Well, any company that makes the promises and earnings claims made by Global Success Club automatically sets off warning bells. Saying that anyone, regardless of knowledge, experience, skill, or otherwise will be able to make $100,000 in 90 days is absolutely absurd. And then to follow that up by further saying that you will be making “Income that is impossible to stop, even if you tried,” is even more ridiculous. In addition, the Global Success Club claims that you will be given a 100% FREE trial of their program for 14 days, and all they ask is that you donate $1 to the Feed the Children Foundation. However, when you click Add to Cart, you are taken to ClickBank, who informs you that it is $1 for a 14 day trial to Global Success Club, after which you will be charged $97.00 each month to maintain your membership. $97.00 a month is an astronomical amount to pay for someone to train you in affiliate marketing, when there are hundreds of programs out there that won’t cost as much and are likely to be just as informative. This leaves the impression that what you are really paying for is the access to the motivational speakers. But that begs the question: were you looking for a business opportunity or a self help club? It’s up to each person to determine their individual needs when beginning their own business, but if you don’t feel like you need motivational speakers to do well in business, then perhaps you should look elsewhere. Average Rating for " Global Success Club " is 3.05 out of 5 based on 57 reviews. I joined gsc on 04/29/2011. People have visited my website but they have not paid the $1.00. I haven't made no sales today 05/25/2011. My membership has expired because I didn't have the $97.00. I have a few new people on my list. Vick said you would have over 50 people on your list. I believe he should change that. Because not everybody will join or pay the $1.00. It seems that we have a lot of reviewers who are praising the system yet not providing any additional details. To the guy who made $700 in sales: Is that on promoting GSC itself or other programs? If it is from promoting the same program, then there is something wrong! I have lost count of the number of people that have SPAMMED their GSC link to me on facebook. So obviously social media marketing is not high on their training agenda. Making income claims contravenes FTC regulations and Global Success Club is not to be found on any list of legitimate network marketing companies that know of. What product does it market? Any home business opportunity that doesn't market a tangible product or service is a pyramid scheme. I agree that I received an email stating user-name and password, but it was no included in the email. Being a newbie I do not know if I might have made a mistake, but can not log onto the account now after registering. What account will the $99.00 monthly be drawn from, I do not have a credit card? Can we use Paypal or Alertpay? I have one important question.. Do they charge me automatically $97 every month? Or they ask me if i would like to pay before they charge me? please answer.. I am not interested at all and I wish to unsubscribe and to deactivate my account globalsuccessclub.com. Thank you! If you haven't tried it you shouldn't have written a review about it. this is an actual legit program. i tried it myself and it made me 700$ in sales already and its only about to be a few weeks since I've joined. this an actual LEGIT program. Is the business model based on recruiting more people to pay the monthly $97 subscription in order for us to make money? Sounds kinda fishy to me. But I guess there are suckers born everyday. Let me tell you my experience. I have tried to sign up for the 14 day trial period. I gave the dollar to the Feed the Children Fund. They sent me an email that said "Username and Password" but my log in info was not in it. Instead it was another sales pitch to get me to join. (I already tried) To make a long story short, I made several requests for assistance to "customer support" I still am waiting for a reply. The links are broken in their site. This has been ongoing for about 8 days now with no reply. If this is what they are about, they won't be around very long. Seriously, they have not responded to me at all! I even talked to the "Live Chat" people at customer support. They assured me that they would "check into it" Still no response!! I was very interested to try if for 14 days but would not recommend it to any body now. I guess you're right to some extent because there are lots of scams and empty promises these days, too bad, but my own opinion, about global success club, $1 trial for 14 days is fair play, if anyone decides not to continue he/she can opt-out before the end of the trial. Is it true that after the $1 14-day trial period, the business keeps charging you 97$ every month which is almost impossible to "unsubscribe"?